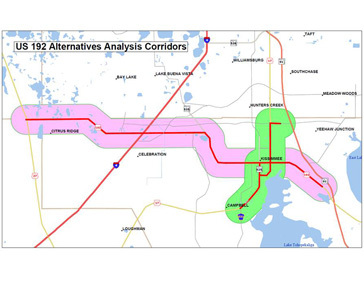 LYNX US 192 Transit Alternatives | Resource Systems Group, Inc.
RSG developed an off-line ridership forecasting analysis tool to study potential transit improvements in the US 192 corridor between Kissimmee, Florida and Walt Disney World. The analysis used the 2010 LYNX on-board survey to develop a Federal Transit Administration data-driven ridership forecasting procedure. Over 2,000 daily customers use corridor bus routes, and survey responses were obtained for almost 10 percent of these customers, detailing origin and destination, trip purpose, mode of access, and traveler socioeconomic characteristics. To supplement the data-driven forecasts of ridership related to existing markets, RSG also prepared order of magnitude estimates of new markets that may be attracted to the project. While existing markets are dominated by non-choice riders traveling to work and other activities, a key goal of this project is to attract choice riders to proposed faster and more-frequent transit services. This may include many of the visitors staying at corridor hotels and traveling to area attractions including Walt Disney World and the many dining and entertainment opportunities in the corridor.